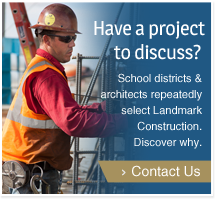 Landmark Construction is excited to share this video from Natomas Charter School – Star Academy, which was completed a little more than a year ago. We’re thrilled to see the Star Academy students and staff make this campus their home for learning and growth. The Star Academy project consisted of the construction of a brand-new campus on bare ground, the first school to be built after the Natomas building moratorium was lifted. The campus has five buildings including an Administration and Resources building, Multi-purpose and Gymnasium building, and three 21st century classroom buildings. In addition to the indoor classroom space, Star Academy also has outdoor learning spaces with large vertical opening doors, communal work spaces, an outdoor amphitheater, playgrounds, play fields and ample parking. The 12-month schedule was aggressive, but with a collaborative approach, our design team and subcontractors overcame all obstacles to successful delivery. Landmark is honored to have been a part of the team to bring this beautiful campus to life. The happy faces in this video are why we do what we do.